July's theme was Jolly July, It's a jolly holiday with your WIPs...you can concentrate on Christmas designs, ornaments, or even pick a different holiday to render in stitchy goodness. And here's how it will look on its scrapbook page. I'll cut it to size and mount it when I've stitched the companion piece which features a snowman. And that was it!! Although, of course, I was running the Summer Postcard Blog Hop which is a holiday so that counts too. I've got a couple more "postcards" to send and would love some more. All you have to do is email me a photograph of a stitched Summery picture and a message and I'll do the rest. For more details and a list of bloggers already in the Blog Hop click on the sunset to the right. Papillon Around the World - stitch at least the outlines for Parts 3 and 4, complete Parts 1 and 2 including the metallics. 12 in '12 - keep up the good progress and either start or finish another one of my 12. NB this does not include the BBD as it is nearly done even as I type. That seems to be enough to be going on with! Finally, the Summer seems to have brought out a batch of new bloggers, like a lovely bed of summer flowers! Welcome to the Wonderful World of Blogging and thank you for your comments. If you add an email to your profile we can reply direct to you and if you add your blog address to your profile we can come stalk you return the following. 1996 - This one was in a magazine from the time. 1997 - This one was from a chart by Anchor which a friend lent me. 1998 - And this one was designed by me! 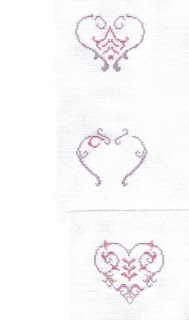 Using borders, alphabets and motifs from a cross stitch book I borrowed from the library. All three are stitched on 14 count aida using DMC 3041, one of my favourites colours. Each features a mixture of cross stitch and blackwork. The mounts are actually lilac to co-ordinate (not blue). The photos are clickable so you can enlarge them if you so desire. Not all my photos are clickable anymore as I've discovered it's quicker to "copy and paste" than use the "insert picture". So if you want to see more detail then pop over to my Photobucket Album (link on the right). Which seems really HUGE compared to the 40count for my Three Hearts design! This pic show the book and lots of lovely papers for scrapbooking plus some postcards and the cutest ladybird mini-frame. And LOTS of little prezzies. And this pic show the inside of the book (open to my favourite project - a doormat with strips of fabric wound round to make a giant cross stitch!) and the contents of the little prezzies. Notelets, charms, embroidery patterns and the cutest mouse button. Thank You Sarah-Beth for sending me Christmas in July, opening all the little prezzies was just like having a stocking full on Christmas morning! Finally, a Public Service Announcement - back in March Blogger discontinued Google Friend Connect for all non-Blogger blogs which basically means some of the blogs I was following fell off my Reader. I recently re-discovered Reflections in the Pond by Silver Lotus via a comment on someone else's blog. So if you used to follow Silver Lotus and wondered where she went, the Good News is - you can find her again!! I've been waiting to start this one until I had the frame. Minnie from All XXs sent me the chart and I knew it would be perfect for my friends' Wedding in June. But I needed the right frame. I finally found one last week, it's three small frames joined together so I was able to work out what size fabric I needed to fit the apertures. 40 count over 2. Perfect as I had some white Newcastle in my stash already. The bottom one isn't offset, it's on a separate piece of fabric! 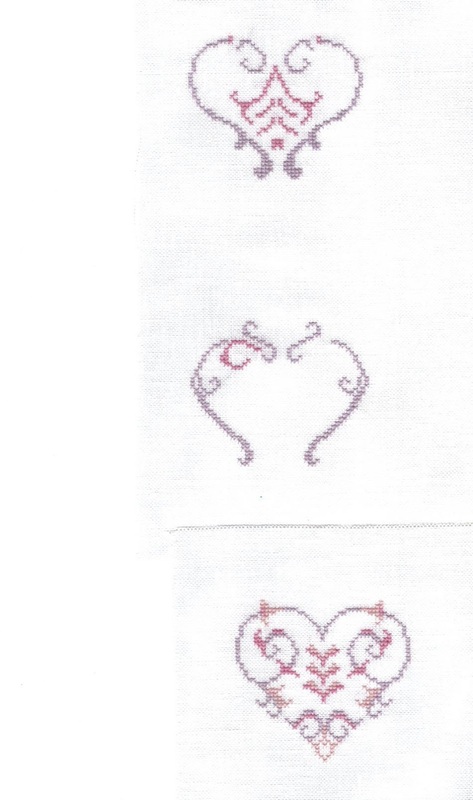 I'm using the threads Minnie sent but only the purple/pink ones as they match the Wedding Invitation. There are also some greens but I might use them if I stitch the design for myself. Finally, the next postcard in the Summer Postcard Blog Hop has been sent on it's merry way across the pond. This time to Cucki at her Stitching Cove. Watch out for it appearing on her blog soon. 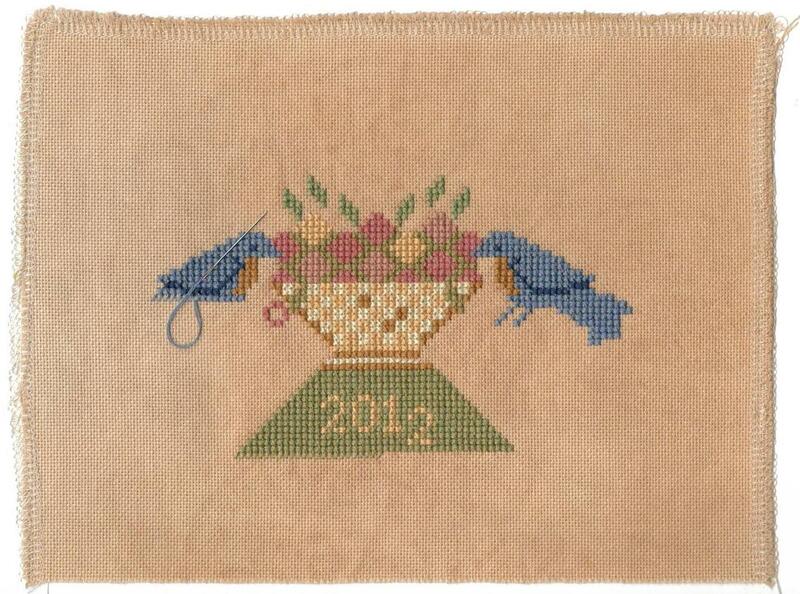 The design was in Cross Stitcher magazine issue 249. The original design was by an illustrator Elissa Hudson and was charted by an anonymous person for the magazine (I couldn't see a credit anyway!). I stitched it on 32count white evenweave using the recommended DMC. I moved several of the letters and motifs around so I could fit in the baby's name and that of his big sister. 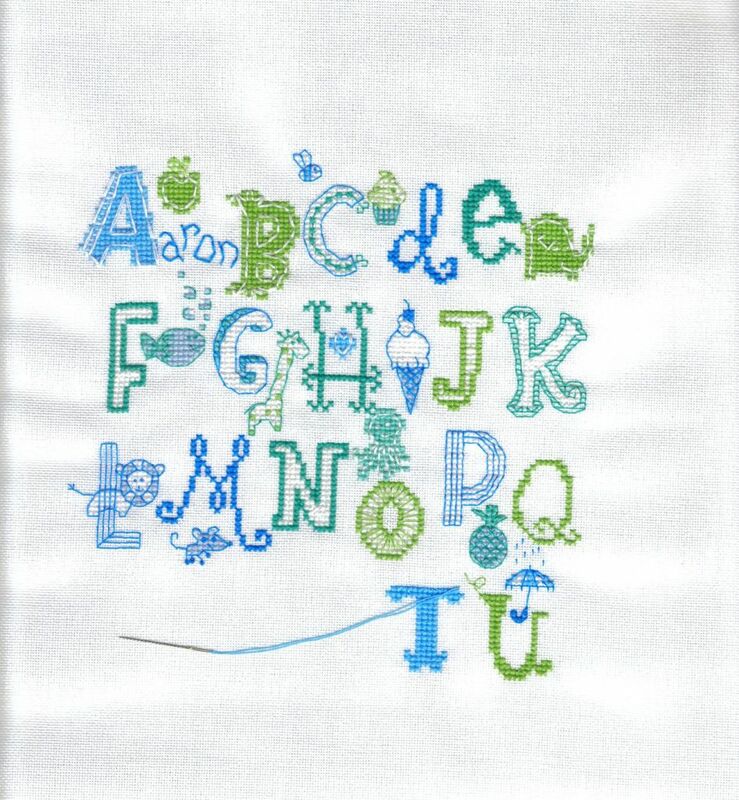 This was a lovely quirky stitch, being able to do one or two letters a session made progress seem rather fast. There was a thick plain turquoise border all around but it would have taken at least a week to stitch if not more and frankly - life's too short to stitch straight lines in one colour! I have given the sampler to baby's Mum and she loved it, as did Big Sis. Baby not so sure LOL. But he is only 17 weeks old. When Madame Muriel arrived she came bearing gifts, one of which was this delightful Blackbird Designs chart. I'm stitching it on 28count evenweave which I've tea-dyed. I'm using the DMC conversion they gave but may change the colours of some of the scattered flowers so they show up more on this fabric. Question - which name would you use? Delphinium or Larkspur? Either name is right but which is more widely used? Delphiniums always remind me of the AA Milne poem about the Dormouse and the Doctor. Finally, another postcard was sent out in the Summer Postcard Blog Hop. Julie's card went to Julie!! Julie Bagpuss to Julie and Yes Dear that is. Julie (and Yes Dear)'s card to go where......? There are plenty more postcards to go out and still lots of time to join in. Just click on the link to the right and read the rules first! Theme-a-licious July Update, Yet another set of 11 things and a Secret SurpriseGiveaway! July's theme is Jolly July - It's a jolly holiday with your WIPs...you can concentrate on Christmas designs, ornaments, or even pick a different holiday to render in stitchy goodness. This is a nice quick and easy stitch, only a few fractionals in the cardinals. I've nearly stitched the border then it's just some snow to do. I'm planning to stitch the matching ornie from last year's Christmas Special and frame them together. 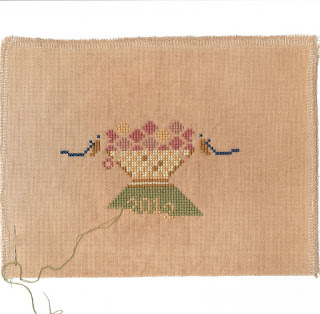 It's stitched on 32count linen in twilight blue rather than the tan colour. 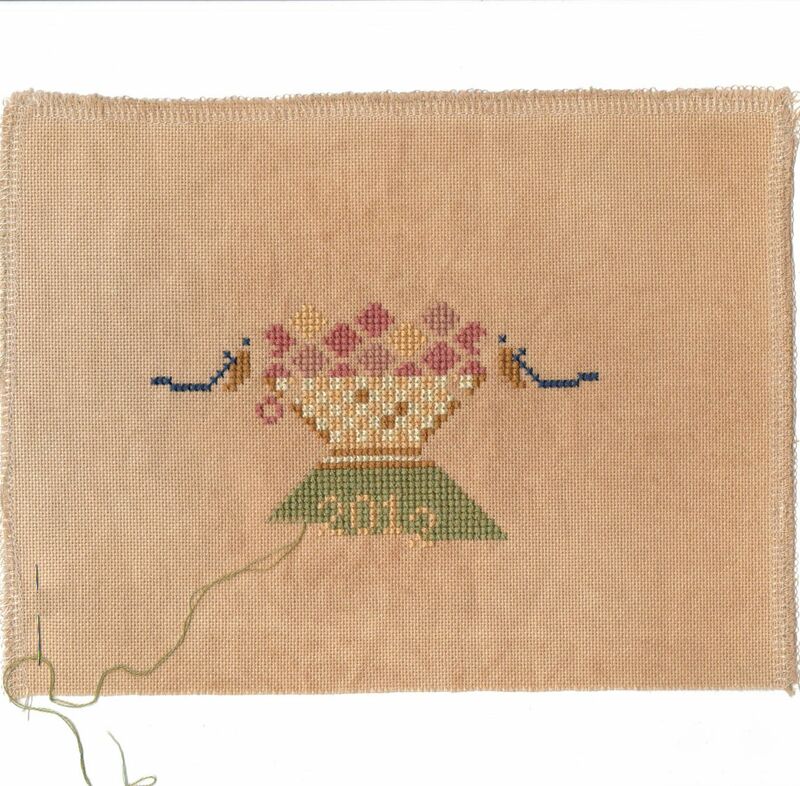 I bought a FQ of this linen for various small projects, it's very stiff but that makes it easier to stitch a small. I think it would be annoying for anything bigger than I'd have to roll up and crease it (I always stitch in hand). What projects do you like to stitch - big or small? A real mixture, I always have one of each on the go. Small for daytime, big for evening. What is your favourite fabric? - 32count Murano for most projects. I do prefer evenweave to linen as a rule. How many cross stitching books do you have? - Lots! More than 20 anyway. I keep them in the kitchen as I can browse them while I'm "cooking"
What is your favourite cross stitching magazine? The now no-longer with us Gift of Stitching. I haven't read all the back issues I treated myself too, I save one per month so I can pretend it's still going!! What time of the day do you do most of the stitching? Weekends and evenings. Does your significant other supports your stitching hobby? Financially or emotionally? LOL. Now I working I can buy my own supplies again. Hubby can't understand why I can't make money out of selling the finished pieces as he sees them as works of art. The Large Boy is always interested in what I'm stitching too. Do you collect stash or just buying supplies for the current project? Collect stash! What is your favourite drink after five? I'm teetotal (does that surprise you?) so it'll have to be a nice cup of coffee! Do you listen to music, audio books or TV while stitching or just to the sounds of nature? At the moment I prefer silence, partly because the Small Boy still isn't sleeping perfectly so I like to be able to hear him if he wakes. Otherwise it's either an audiobook or Kerrang Music Channel. Do you have any live plants in your home? Love this question as I have at least three dead ones!! I have some very leggy cyclamen on my kitchen windowstill, they're still alive. What do you like to read? (Adventure, romance, mystery, non-fiction etc.) Books or magazines? Fantasy and Sci-fi. I'm reading alot of YA (Young Adult) at the moment for work. As I mentioned in a previous post I get some advance copies of forthcoming releases which is a huge bonus! I've just read John Boyne's new one "The Terrible Thing that Happened to Barnaby Brocket" a nice story about a floating boy. I've also started reading Eragon out loud to the Large Boy at bedtime, 2 chapters a night, it's going to last us most of the year as there are four books in the series. And the Secret Surprise Giveaway? I've been keeping an eye on my comments as they crept towards the 2000 mark. This weekend Anne from Doll's Musings left 2 comments, they were numbers 2000 and 2001 so she is my Secret Surprise Winner! Not sure what she's won yet but I'll let you know when she gets it. Don't hold your breath anyone, Christine is still awaiting her Easter Prize! Finally - the finished Noah's Ark by JBW. A lovely gift from the lovely (and generous) Kaye of Kitten Stitching, totally unsolicited she sent me the chart when I admired it on her blog, along with the fabric and thread. As baby was already here I had no excuse not to start immediately! I love this design with all the cute little animals. I think the little elephants are my favourites. It is stitched on 28count flaxseed linen 1 over 1. At the end of the School Year it is traditional to give the teacher a little gift, certainly at Primary School anyway. I often stitch a little sampler of their favourite thing and the details. This year the Large Boy's teacher is one he had for some lessons in Year 2 so she has already had a cross stitched gift. As she is expecting a baby in 10 weeks I've decided to wait and stitch baby something. The cover gift with Cross Stitcher magazine was a lovely Emily Peacock design and I thought it would be perfect for the class' Teaching Assistant. I don't usually make a gift for the TA as they tend to help the lower ability children so the Large Boy is doing well to know their name by the end of the year! But this year I've got on well with her thanks to the Small Boy who likes to run round the classroom at the end of the day. She's also a book fan and her daughter wants to work where I do so I'm keeping my eyes open for vacancies. It's stitched on 16 count aida, in usual Cross Stitcher incompetence they included 14count which meant the stitching would be too long for the bookmark provided! Luckily I looked on Facebook and saw the comments about it so I was able to use some 16 from my stash instead. There are lots of peeved stitchers who didn't realise! The magazine are currently running a satisfaction survey, I'd LOVE to be one of the analysts reading the replies! The books behind the bookmark are some of my "Reading List" from work. The red ones with crescent moons are from World Book Night and the others are proof copies I get sent to read, review and recommend to customers. They are mostly Young Adult or age 9-12 which is great for me and the Large Boy. I'm currently reading Witchstruck which describes itself as "Twilight meets The Other Boleyn Girl", a fairly accurate description! I'm enjoying it. This is a superfast stitch! I love all the cute animals. I charted the baby's name and DOB this evening so it'll be finished by the weekend. Another of my "12 in '12" finished, YAY! Finally the latest postcard in the Summer Postcard Blog Hop was sent to Julie of Julie's Stitchyknitter Journal. Keep an eye open for when she posts it. If you want to join in and send/receive a postcard then just click on the Wish You Were Here link on my righthand sidebar. You have until the end of August. It's been raining buckets off and on all week. Thursday was our town's day for the Olympic torch and fortunately was gloriously sunny. The next day was torrential rain, the next sunny and today rain all day again! So here I am stitching on an Ark to save us all! My cousin's new baby sampler has been on my "12 in '12" list this year and I'd planned to do the two nut brown hares from "Guess How Much I Love You" but with my reduced stitching time it was going to be too ambitious. Then I saw Kaye's post on her Kitten Stitching blog. She was stitched a cute little JBW Noah's Ark and said how quickly it was stitching up. I commented that it was perfect for my new little cousin intending to buy a copy, lo and behold Kaye gifted me her chart when she finished it! I'm stitching over 1 because I like it! What is nice about the design is that once you've stitched one little animal and placed the next you don't have to look at the chart, just copy the first one. I also love that the animals are totally recognisable even though they are such simple silhouettes. Remember the Warhol-inspired design in my previous post? Well, I emailed Marie-Therese with my finished photo to say "hope you like it". She did, and posted on her blog about it! She called me "délicieuse" which I love! She also pointed out that I'd called it a rose when in actual fact it is a pansy! The trouble is I saw the title "La pensée rose de la nuit de la broderie" and confused rose meaning pink with the flower. I didn't know the word "pensee" at all and Google Translate was no use. It said it meant "pink thought of the night". The latest postcard in the Summer Postcard Blog Hop has been mailed out to the Southpaw Stitcher. Keep an eye on her blog for when it arrives. I'll be sending the next postcard soon so watch out in your in-boxes. If possible post the picture on your blog as soon as you can so I can link to the actual blog post. Finally, not much actual stitching this post, I've been mainly stitching a bookmark for the TA at school (teaching assistant) but it's so close to finish I'll show it then. So I'll ask a question instead. When you stitch a freebie design, especially one from a blog, do you email the designer to show them your finished work? I try to do so and people seem to be really pleased when I do, a little Thank You for the freebies. 8. Turquoise Baby Sampler - Stitched several more letters, O, P, Q, T and U. 11. Papillon Around the World in 80 Stitches. Started Part 2, stitched the top tulip. Added the metallics to the hearts. Nothing at all for Nan this month. But I did frame Summer and got it up on the wall. This was actually completed all except a dozen beads about 10 years ago! I stitched on two different Round Robins and did some guinea-pig stitching for an online friend. Regular readers will know I join in with the Needlecraft Haven Freebie Challenge each month. Christine chooses a chart for us all to stitch. June's choice was a rose in an unusual style. The original was nice but I thought of a conversation I'd had with Karen where we'd been planning our Giant Mirabilia RR for 2013. I wanted each person to stitch their birth month fairy but it turned out that three out of four of us were September! So I said we should each stitch her but in different colours for an Andy Warhol effect. I stitched this on 16 count aida, hand-coloured with my trusty fabric pens. I chose some vibrant colours and went for it! That yellow is actually fluorescent. Here's the link for the original design by Marie-Thérèse Saint-Aubin. Finally, the obligatory Summer Postcard Blog Hop mention. LOL. Click the Sunset picture to the right of my blog to find out more.